Your real estate business solution – straight out of the box! House hunting, the single biggest purchase in most of our lives and notoriously one of our biggest headaches. But it can also cause headaches for real estate agents too. It’s a full time job keeping up with what properties are on the market and where, remembering which clients need following up, making sure your admin and sales staff are keeping on top of things. If you don’t stay ahead of the game, and most importantly stay organized, other agents could entice your customers away and collect the commissions that should rightly be yours. So what’s the solution? It all comes down to your computer and the software that you use – and the right software is to any real estate business what Neurofen is to any headache. As real estate software specialists our team relieve you of the technical headaches, leaving you more time to do what you do best… sell property! Alphashare is the ultimate Client Relationship Management (CRM) and Property Sharing (MLS) system for any real estate business. On establishing the company back in 2003, the founders had already amassed years of software and networking experience between them – one as a developer of internet solutions for blue chip clients such as Qantas Airlines and Andersen Consulting, the other a Microsoft Certified Engineer and a specialist in hardware and server configuration. Alphashare was created to fulfil a need in the international real estate industry for a good quality, user-friendly property system. Many agencies complain about sluggish, inadequate software and constant system breakdowns. What Alphashare provides is a stable, quick, virus-free system that works anywhere, on any operating system. It offers tangible benefits for the user whereby they can enjoy increased productivity, increased sales and therefore increased profits, whilst still being very simple to use. Alphashare enables real estate agents to become more efficient in handling client enquiries, sharing property listings with other agents, managing correspondence and a whole host of other invaluable features. The system enables real estate agents to have up-to-date information at their fingertips, all records of previous communications with their clients on screen in front of them and immediate access to a large portfolio of properties, particularly if they choose to share with other agents. Indeed, one of the biggest advantages of Alphashare (apart from being unparalleled for it’s administrative features) is your ability to seamlessly and flexibly share properties with other agents. The difference between offering a client just a handful of properties to view or a selection dozens could be the difference between making a sale or sending a disappointed customer on his way. If you have special properties that you want to keep exclusively to yourselves, an added bonus of this very flexible system is that you can choose what to share with other agents and by the same token you can choose which agents you want to share with and those that you don’t. In the competitive world of property sales and marketing, Alphashare gives members the competitive edge; it keeps your staff and your customers happy and it is unquestionably a platform that real estate agents can ill-afford to be without. 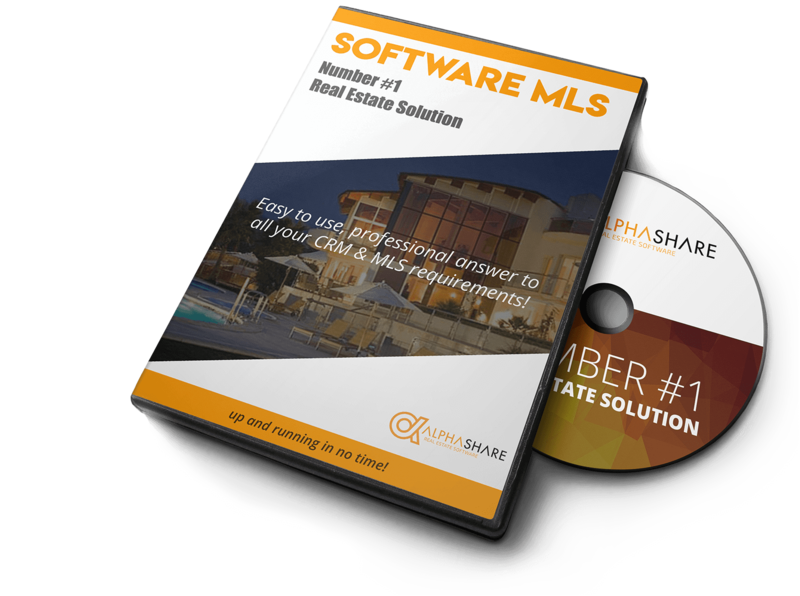 Alphashare is a low cost, turnkey real estate software solution and, unlike some other systems, doesn’t require you to pay any commission from sales. All you pay is a nominal ‘all-in’ fee on a quarterly, bi-annual or yearly basis. The user has no need to install software or keep having to check for updates as the whole system is hosted and backed up daily on secure servers in the United Kingdom. Perfect for the smallest or the largest company, Alphashare can be up and running within a few hours and the only thing that the real estate agent has to worry about is having access a computer, tablet or mobile device that can connect to the Internet. Alphashare can be accessed from anywhere in the world via a web browser, so if you’re away from the office or at a property exhibition elsewhere, you can still keep abreast of the market and your client correspondence. Alphashare can easily be integrated into an existing website and also gives you the freedom to modify and update your site yourself via your own user-friendly admin panel. If you don’t have a website yet, or wish to modernise the one you already have, Alphashare also has it’s own in-house team of professional designers ready to help with any requirements you might have, and at very competitive prices.